This is my third CAKE concert. It’s an all Cake event. It took us some time to find parking. When we got in around 8:15, Cake just started Opera Singer. A bit gutted for missing the “grand entrance”, I soon got into the joyous groove. 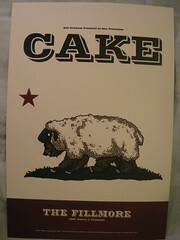 Cake’s music always has the power to infuse instant glee to listeners. After Opera Singer, John greeted us, and jokingly pleaded, “Some people think they’re skipping the opening band. There’s no opening band. We’ re the opening band; please don’t skip us.” Cake’s layback and humorous music brought a smile to everyone’s face; many people, including myself, swayed with the beats, fully enjoying ourselves. Happiness – that’s really all I want to say about a Cake concert – pleasant, delightful, jolly, blissful… and all their fellow synonyms.